It’s a well known secret that one of the single best investments you could have made over the past fifty or sixty years was to buy and hold Philip Morris stock. Had you invested $1,000 in the late 1960s, and continually reinvested the dividends along the way, then your holding would be worth roughly $6,000,000 today. The sheer scope of those returns – compounding at a rate of about 20% a year – is unmatched by any other stock in the S&P 500. There are many aspects that are fascinating about that, but none more so than the fact that tobacco has actually been on the decline over that time frame. Sales volumes have been falling at a steady rate along with the proportion of smokers in the general population. In fact tobacco in general has been one of the worst in terms of declining contribution to the economy whilst simultaneously representing the single best sector for stock investors over the past hundred years. The interesting thing is that it actually wouldn’t have even really mattered at what point the initial investment was made either. I mean even the most recent fifteen year time frame has seen tobacco stocks such as Imperial Tobacco and British American Tobacco deliver annual returns of something like 15% a year (see here and here). Altria itself has delivered similar returns once you factor in the spin-offs of Kraft Food (and subsequently Mondelez International) and Philip Morris International (the ex-USA arm of the original firm). The reasons behind that have been mentioned in previous posts – but chiefly you’ve had a situation in which for most of the past sixty years these stocks have been seriously underestimated in terms of growth potential. Tobacco was dead and these stocks with their 5%,6%,7% dividend yields reflected that. The catch was that when you have companies that can convert 25% of their revenue into free cash flow every single year trading at under 10x earnings and with a 5%+ dividend yield, then it only takes a modest amount of earnings growth in order to set off the kind of returns that these stocks have managed. Now let’s contrast the situation describing tobacco stocks for much of the 2000s with the present day. Back then you had an era in which the earnings multiple was low, the dividend yield was high and risk free government debt offering you a yield that was also pretty attractive. Today you have an earnings multiple that is high, a yield that is much lower and risk free government debt also with historically low yields. Let’s take a look at Philip Morris stock in more detail. This time in 2010 investors were looking at revenues of $27.2bn, net income of $7.25bn – equivalent to $3.94 per share – and a stock price of $48 per share. This year revenue will also come in at around $27bn, net income at around $7bn – that’s $4.50 per share – and with a current stock price of $101 per share. On a free cash flow basis it’s a similar story: $4.74 was generated per share for dividends, share buybacks and debt repayment in 2010 versus $4.46 last year. In addition to that you have $15bn in net debt on the Philip Morris balance sheet six years ago compared to $27bn today. Now, the picture of stagnant revenues and earnings needs to be taken into proper context. The Philip Morris spin-off from Altria group essentially bundled all the international tobacco operations into the new company, with Altria retaining the tobacco operations of the home American market. Sales are therefore priced in a myriad of local currencies whilst the company, which is listed in New York, then covert those sales into US dollar terms for accounting purposes and more crucially the dividend. Since the greenback has strengthened significantly over the past few years then this has obviously hurt the accounting figures, and even more so when combined with the general declining trend in tobacco volumes. Despite the troubles that a strong dollar has on the bottom line for an American company that operates exclusively outside the US the dividend has continued to grow. Back in 2010 a Philip Morris shareholder was collecting a dividend of $2.44 a share. By 2015 that dividend had grown to $4.04 a share, with shareholders collecting about $13.50 a share in the intervening period. As earnings have largely been flat owing to currency issues the company is now distributing nearly all of its profits back to shareholders as dividends. Indeed the pay-out ratio is somewhere around the 90% mark. 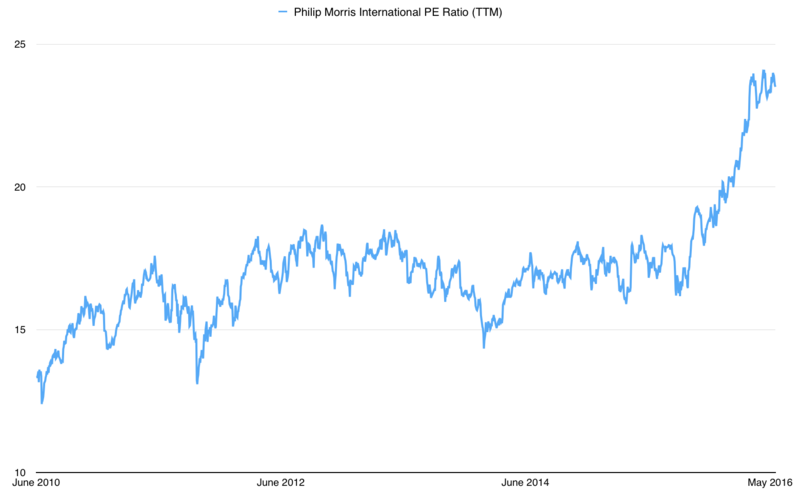 What does this mean for Philip Morris stock going forward? Well, I guess this is probably one of the few occasions in which the expected value isn’t all that great for the long term. The company still generates exceptionally high quality profits, but you have the value multiple working against you in a way that didn’t happen fifteen years ago. In other words that earnings multiple is not providing the tailwind that it would have done back in 2000 or even as recently as five or six years ago. The reason why it gets so important to go heavy in equity in periods of low valuation is the mean reverting nature of it. If you can pick up these high quality companies in times of market meltdowns then a good chunk of forward returns come from expanding multiple ratios as they eventually revert to the mean. The 2008/2009 financial crisis is the best recent example of this, and you can see it in the stock prices of companies like Procter & Gamble and Johnson & Johnson. Earnings haven’t grown hugely for either of these two, but the fact you could get them at like 10x their yearly profits means you’re almost guaranteed good returns over a ten year period. In the case of Philip Morris stock you’re currently at 21x earnings, a 4% dividend yield and a 90% dividend pay-out ratio. In 2010 you were looking at 14x earnings, a 5% yield and a 62% dividend pay-out ratio. The stock will continue to throw off cash for years to come; it’s just that in all likelihood the returns won’t come close to matching the levels that made this the greatest investment of the last half century.